Venezuela: Economic war or government errors? 1. When Chávez triumphed in the presidential elections of 1998, the neoliberal capitalist model was already falling apart. The dilemma was none other than to either reform the neoliberal capitalist model, evidently with changes, and amongst those a greater for concern for social issues, but still orientated towards the same profit seeking motive, or to move forward with the construction of another model. 2. Chávez chose the latter option. To give it a name, he decided to rescue the word socialism, despite its historical burden of negative connotations. He specified that it should be socialism of the 21st Century in a bid to differentiate it from the Soviet socialism implemented during the 20th Century, and warned that it must not “make the same errors of the past”; the “Stalinist deviation” which had bureaucratised the whole party and put an end to popular protagonism, or the state capitalism which emphasised state property and not the participation of the workers in directing enterprises. 3. Chávez conceived of socialism as an economic system centred on the human being and not on profit, with a diverse and anti-consumerist culture in which being took precedence over having. A socialism endowed with a real and profound democracy, where the people assume an active role. This is a characteristic which distances it from other proposals for democratic socialism. For him the participation of the people in all spheres was what would allow them to gain confidence in themselves and develop as human beings. 4. However this would have remained as mere words had he not promoted the creation of adequate spaces where participatory processes could fully develop. That is why his initiative to create the communal councils (small self-managed territories), the workers’ councils, the student councils and the campesino rural workers councils was so important. These were about progressively building a genuine collective structure that was to be articulated in the new form of a decentralised state, with the communes as its fundamental cells. 6. One of the historic achievements of the Bolivarian revolutionary process was to have been able to call a Constituent Assembly and subsequently approve a new Constitution that changed the rules of the political game, putting obstacles in the way of neoliberalism. It posed opposition to the large-landed estates and the privatisation of Venezuela’s state oil company in favour of the small-scale fishermen weakened by transnational fishing companies and the propagation of micro-credit cooperatives, as well as opposing the privatisation of education in favour of free education, and opposing the privatisation of social security. This Constitution also advocates for the rights of indigenous peoples, for children, for the right to free access to information, and defends a participatory model in which citizens play a protagonistic role. 7. However being realistic does not mean succumbing to a conservative vision of politics, conceived of as the art of the possible. For Chávez the art of politics was to make the impossible possible, not through sheer voluntarism, but rather because by taking reality as his starting point, he sought to create the concrete conditions for changing reality itself, through constructing a correlation of forces favourable for change. He understood that to make what seemed impossible in the moment possible in the future, it was necessary to alter the correlation of forces, just as much at the national level as the international. During all the years of his government, he worked in a magisterial way to achieve this, understanding that agreements amongst the top leadership were insufficient for building political strength and that the main goal was to build social strength. 8. It is impossible to understand the Venezuelan process without weighing up the global context in which it was obliged to insert itself into. Following the defeat of socialism in the Eastern bloc, and especially in the USSR, an extremely negative correlation of forces existed for progressive forces. The socialist camp had disappeared, along with all of its symbolic and practical weight, and the United States had become the primary military power in the world with absolutely no counterweight. The situation was very different when the Cuban revolution triumphed or during the Popular Unity government in Chile. 9. Chávez was conscious that he could not carry out a social revolution in isolation given this global correlation of forces, and he dedicated himself to building international forces to support the Bolivarian process. He promoted South American and Caribbean integration projects, orientated towards solidarity. He privileged his relationship with the Organization of Petroleum Exporting Countries (OPEC) and moved closer to other poles of global power such as India, Russia and China, while simultaneously embracing links to other forums of emerging nations, such as The Group of 15 and South:South Cooperation, The Group of 77 and the Non-Aligned Movement. In the Southern Cone, Chavez sought an alliance with Brazil to oppose the Free Trade Area of the Americas (FTAA) and to gain full membership of the Common Market of the South (Mercosur). 10. Together with other Latin American presidents, he managed to defeat the US FTAA project, putting forward an alternative proposal for integration: the ALBA (the Bolivarian Alliance for the Americas, today known as the Bolivarian Alliance for the Peoples of Our America). He embraced relations with Cuba, even supplying the island with oil under special payment conditions in exchange for services, doctors, the sale of general medicines and technical assistance in agriculture, tourism and sports. He financed “Mission Miracle,” which gave millions of Latin American people on low income their sight back. He also established an agreement to provide 11 Central American and Caribbean countries with oil under preferential contracts as a gesture of cooperation. 11. Chávez also understood that politics must come before the economy, and that is why he played a fundamental role in creating spaces for presidents across the region to come together, such as the Union of South American Nations (UNASUR) and the Community of Latin American and Caribbean States (CELAC), in spite of the fact that they had different economic perspectives. The most important objective was to get them to come together without the presence of the United States. The creation of the Bank of the South and the Bank of the ALBA are also orientated towards this rationale. 12. As he understood that it was impossible to build political strength without building social forces, he supported initiatives for spaces where social movements from across the region could come together, alongside these government gatherings. 13. The creation of Telesur was also thanks to his inspiration - a fundamental initiative to confront the media war that the progressive governments in Latin American would inevitably have to face. Chávez used to repeat a phrase by Simón Bolívar: “They dominate us more through ignorance and superstition than by force”. Thanks to this television channel we are correctly informed of what is really going on in the region. 14. I concur with Atilio Boron that Telesur is dangerous because it shows the truth of what is happening, not just in this part of the world, but across the whole planet. By showing the havoc wrought by imperialism, it awakens people and feeds their rebelliousness against an imperial order which takes the lives of tends of thousands of people across the globe daily. That is why it has become a serious threat and the most conservative political forces will use all means available to silence it. 15. Although there are some setbacks in the region, nobody can be in doubt that there are a million miles between the Latin America that Chavez took on and the one that he left us with. 16. Taking advantage of the huge leadership vacuum left by his physical disappearance, attacks against the Bolivarian revolutionary process have escalated, both inside and outside the country. As it would be very difficult to attempt another state coup against president Nicolas Maduro - who has tried to be consistent with the legacy of Chávez - the economic war initiated during the preceding period has intensified: the Venezuelan government has received “in just over three years, the equivalent amount of attacks that Chávez did throughout fourteen years”. One of its objectives has been to affect the system for accessing basic foodstuffs at subsidised prices, promoted since 2003 through Mission Mercal, with significant results in guaranteeing the right to food. 17. The issue of the economic war has been recently addressed by the renowned Venezuelan intellectual and ex-minister in the government of Maduro, Reinaldo Iturriza , from whom I have borrowed many of the ideas that I will now set out in reference to the Venezuelan rightwing’s strategy. However I want to begin by saying that something very similar happened in Chile to destabilise the government of Salvador Allende. 18. Let us remember the measures that began to be applied in that country immediately after an electoral win: a run on the banks, black marketeering on the dollar, the shutting down of some industries, a blockade on the importation of primary materials and necessary replacement parts for the running of industries, etc., a blockade on the government’s attempts to modify the unfair taxation system using a parliamentary majority, denying approval for budgetary resources to pursue plans of a social character, the deliberate attempt to create fear amongst foreign investors and local business people, leading to a productive standstill in the medium term. 19. The aforementioned plan was fully supported by the Nixon government and multinacional consortiums, which executed an economic siege operation translating to: the reduction of credits, placing obstacles in the way of renegotiating the foreign debt, an embargo on the goods produced by expropriated companies, and the dissemination of the image of a bankrupt country internationally, to besiege it even more from a financial point of view. The government of Allende, which did not want to affect the bargaining power of the workers, had no other alternative but to increase the amount of cash in circulation, knowing that this would have a strong impact on inflation. At the same time, the offensive of the North American government prevented it from maintaining the volume of food imports necessary to keep up with the purchasing power reached by the popular classes. The problem of hoarding became more acute day after day. Building on this base target, reactionary forces began to aggravate the economic situation through speculation, hoarding and the promotion of the black market; while the press they controlled unleashed a systematic campaign designed to exaggerate shortages and make them the focal point of their attacks. To this macabre plan they added cacerolazos (the act of banging on pots and pans in political protest), street demonstrations, transport stoppages, strikes in the copper sector, and demonstrations against the soldiers that supported the regime. 20. In Venezuela, two principle strategies have been applied to affect economic development and, along with it, to create discontent amongst the population: induced inflation and orchestrated shortages. According to the Venezuelan economist Pasqualina Curcio, this is achieved, on the one hand, through the manipulation of the exchange rate on the parallel and illegal market, which symptomatically increases exponentially in the months prior to elections, and on the other hand, through the manipulation of the mechanisms for the distribution of essential goods to create artificial shortages. 21. According to Curcio, these strategies are viable because of the characteristics and historical determinations of the Venezuelan economy. In fact, there is a “concentration of production, imports and the distribution of goods and services in very few hands”. Three percent of registered economic enterprises in the country control foreign currency for imports, meanwhile there is also a “high dependence on imports”. 22. These import monopolies and bankers, that do not produce goods but simply make extraordinary profit through the price difference between what they buy abroad and what they sell inside the country, set the prices of the goods they import (basic necessities, among them food and necessary items for production and transport) in an oligopolistic manner, using the parallel exchange rate which is much higher (14.5 times) than the real value of the goods calculated in national currency. Great economic power has been accumulated through this, which has translated into political influence and is reflected in the institutional sphere. 23. 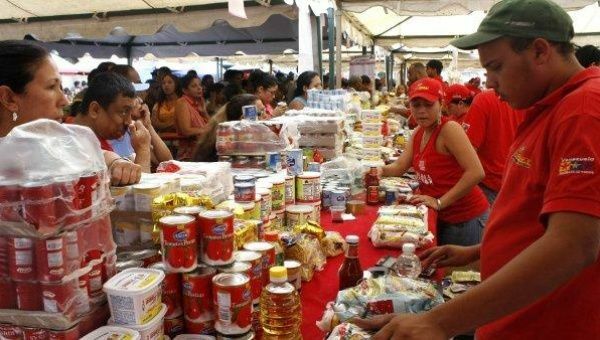 Not only does the increase in the prices of necessary goods do harm to the Venezuelan people, but it also works against sectors of the bourgeoisie which produce other goods for everyday use (capitalist agriculturists and manufacturing industrialists). Finding themselves obliged to buy primary material and other goods that are used in the production process at the price set by these importer monopolies, they have to sell their products at increasingly higher prices in order to maintain the profitability of their businesses. And as the purchasing power of the population has become severely reduced due to the existing inflation rate, people have found themselves obliged to prioritise buying necessary items (food, medicine, transport), restricting the purchases of other, less essential items. This has only favoured big importer capital, and has reduced the sales of businesses which produce these goods, consequently affecting their profitability. 24. In terms of orchestrated shortages, Curcio explains that this practice - which was initiated in 2003 and affected a handful of products - became generalised in 2013. The term orchestrated shortages is used since the absence of certain products in the national market bears no relation to production levels or to the importation of said items. The enemies of the process create artificial shortages by failing to put these items on shop shelves in a regular and opportune way and in sufficient quantities. 25. How can we not label these rightwing strategies to produce economic chaos in Venezuela, bringing the government into disrepute and establishing the basis for its overthrow at elections, an economic war? 26. Unfortunately, the Venezuelan government has not managed to confront the terrible national and international media campaign with convincing arguments. These circumstances have led to a tendency whereby important sections of the Venezuelan population and a huge majority of those who follow the Bolivarian process from outside the country using the media, hold the government, and not the real actors, responsible for the shortages and inflation. 27. Naturally these attacks are being carried out on fertile ground due to the weaknesses of the economic policy adopted by the government, which was incapable of predicting the fall in oil prices. This is in addition to the exchange rate policy and a massive pro-importation policy which discouraged national production and placed the country in a situation where it is increasingly dependent on imports. But nobody can deny that a sector of the Venezuelan bourgeoisie and the corrupt state bureaucracy are taking advantage of this objective situation to deepen the crisis and bury the emancipatory Bolivarian project, attempting to restore the Fourth Republic: a paradise for the few, but suffering and marginalisation for the majority of the people. 28. I fully agree with Reinaldo Iturriza that the bourgeoisie sees Chavismo as a “scourge”, “not so much because of its ability to unite discontent, but rather because of its resolute actions against the status quo,” as well as the fact that it has imposed limitations on economic powers. 29. According to the Venezuelan researcher, Chavismo is alive but “it is absent from much of the analysis on Venezuela. An omission which often arises from the deliberate intention to keep ignoring the historically invisibilised, who are today subjects of a process of revolutionary change, and on other occasions, because of a blindness in a certain sector of the Left which - prevented from seeing the revolution of which it has always dreamed come to fruition - dismisses the revolution being carried out by real men and women as nightmarish. 30. I concur with Pasqualina Curcio that one of the principle challenges ahead of the Venezuelan government is to secure an efficient state intervention in the regulation of the monopolies. It is difficult to understand, as Reinaldo Iturriza says, that a part of the bureaucracy continues to favour these monopolies or importer oligopolies, or banking interests. 31. On the other hand, in reference to the aforementioned point, it is clear that objectively there are opposing interests between the different sectors of the Venezuelan bourgeoisie and that is reflected in the political panorama. The opposition is not a homogeneous unity. There are enormous contradictions at the heart of it. There is a sector of the opposition that, instead of worrying about how to resolve the problems of the country, is playing at overthrowing the government using all the methods within its grasp, especially economic strangulation. The corrupt sectors of the importer state bureaucracy also contributes to this. It is impossible to reach agreements with this sector. However, there are other sectors with whom it would be possible to reach an agreement if the correct tactics were used; those who are prepared to prioritise the interests of the country. 32. We should be sufficiently skilful in exploiting these contradictions and to advance a coherent process of dialogue, calling on the opposition to search for solutions for the country, and avoiding verbal attacks on both sides which contribute to an atmosphere of distrust. This is one of the fundamental conditions for maintaining constructive dialogue. It was recently announced that an agreement had been reached between the Venezuelan government and the opposition to invite the Pope to be one of the mediators in the dialogue. This has put hope on the horizon. “(The dialogue cannot be) dialogue-for-show in which we pretend to take part in dialogue (and only listen amongst ourselves). (…) To dialogue is not to negotiate. To negotiate is to try to get your piece of the pie. (…) If you go with that intention, don’t waste your time. It is searching for the common good for all. To debate together, to think of the best solution for everyone. (…) By trying to understanding the reasoning of the other, by trying to listen to his experience and his wishes, we can see that a great number are common aspirations. 36. Lastly, just as nobody would blame a cooking recipe for a flan which burnt when the oven was turned up too high, the difficulties which Venezuela is living through cannot be used to sustain the argument that history has proven the project of Socialism of the Twenty-First Century, proposed by Hugo Chavez, to be unviable. What we have to seriously analyse is what we did not do well and what we learnt on the way that we should not repeat. Many of these errors are understandable, given that there were no ready-made models to indicate the path we should follow and it was necessary “to invent in order not to make a mistake” - as Simón Rodríguez, the tutor of Simón Bolívar, used to say. We could say that they were necessary errors. 37. Venezuela was the beginning of a cycle of change in Latin America. It was the rebirth of hope, it was governing to resolve the problems of the disadvantaged, understanding that it is impossible to resolve the problem of poverty without giving power to the poor. It was the incarnation of solidarity with brother peoples in the region that were in economic difficulty. Today, this nation is suffering more that other countries; from the beatings of a global crisis of capitalism and an economic war deployed against it, concentrating the greatest attacks of the reactionary forces of the world. It deserves all of our solidarity. Let us know how to return the noble and incredibly far-reaching generosity it extended to the poorest nations and peoples of the region and the world by forming a defence cordon around the Bolivarian process. 38. To conclude, I believe we can be optimistic. Without a doubt, what Chávez sowed has marked his people, and it has made them mature, as I could testify in person during the years I lived in the country. I believe that all those people who were given the opportunity to study, to think, to participate, to build, and to make decisions, that grew enormously in their self-esteem and matured as human beings, will defend the process. 40. I have always said that it is necessary to measure the Venezuelan revolutionary process, not by the transformational measures adopted - of which there are many - but rather by the growth of the revolutionary subject, and that achievement is Chavez’s doing. The process may have committed errors and have many weaknesses, and I painfully noted them at the time - but what he achieved with his people, that is something nobody can ever erase! First theoretical Aló Presidente, June 11 2009. Reinaldo Iturriza, Chavismo and Revolution: What is going on in Venezuela? August 29th 2016. See: http://www.rebelion.org/noticia.php?id=216115. See: Marta Harnecker, Reflections on the government of Allende. Study the past to build the future, at: http://www.rebelion.org/noticias/2016/9/216627.pdf. The highest variations that have been registered are: in the months prior to October 2012 (presidential elections won by Hugo Chávez), in December of the same year (elections for governors), April 2013 (presidential elections held due to the death of Hugo Chávez), and December 2013 (municipal elections). From then on, the increase in the parallel dollar has been sustained and disproportionate, explaining the unfavourable results for the government in the parliamentary elections. Op.cit. Words in a meeting with representatives from civil society in Paraguay, León Condou stadium of San José School, Asuncion, Saturday July 11 2015. I extracted only the essential parts, the Pope addresses the issue in greater depth.